To enter the Cloister of S. Augustine, if a tired hand turns, the show is facing four monuments, the penultimate of which we will describe below (Table LXIII.) 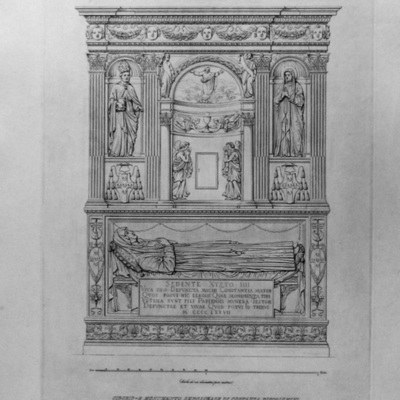 And the last is dedicated to the memory of Constance Piccolomini, whose son speaks very fondly of it 'four verses that are read in the plaque in front of the coffin. The monument was erected in the church of S. Augustine the year 1477, under the pontificate of Sixtus IV; afterwards for the changes which are suffering inside that temple, was transported to this beautiful work in the cloister, where it exists, however, but however much damaged. The lower part of this monument is simple, as anyone can see, but not missing in ornaments conducted with very good grace. The top three pillar components, of which the middle one form as a small front building, flanked by two Corinthian columns on which they are standing straight up two Evangelists, each with a parchment explained and you turn around an arc, in which the center of the middle relief is carved the figure of Christ, that men should be reminded he lay on the ground in one piece in a sacrament of love. In these columns, we do not know when they were replaced with two spirals very ugly, which (discordine) as with the rest of the monument will be able to see every man for himself. Under the cornice, which, starting from the capitals of the columns, turns in a vain quest ' interpillar format niche, are two angels holding a cup in her hands on which is far-fetched the sacred Eucharistic symbol of our faith. More still under (opresi?) the door that was to enclose the sacred species, the sides of which are placed two angels standing in adoration. The niches carved into the two-pillar side are occupied by two figures, one representing St. Augustine and the other Menasca: perhaps hinting at a special devotion to these saints of the buried. 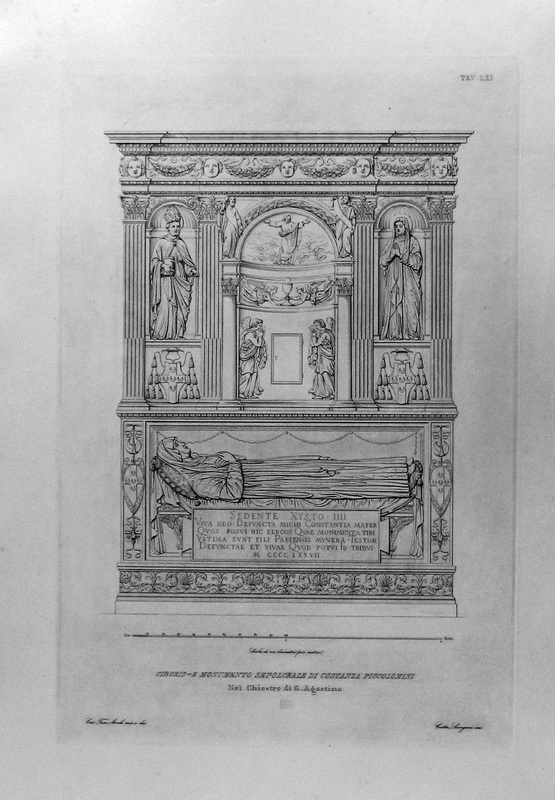 Drawn by Francesco M. Tosi, “Ciborio-e Monumento Sepolcrale di Costanza Piccolomini Nel Chiontro di S. Agostino,” LLB Galleries, accessed April 23, 2019, http://artgalleries.milne-library.org/items/show/283.